With the first phase of the Expo Line scheduled to open later this month, I recently interviewed Darrell Clarke, the co-chair of Friends 4 Expo Transit, a group that has worked tirelessly to ensure that Los Angeles has light rail, rather than a busway — or no transit at all — along the Exposition corridor. My interview with Clarke follows. Good afternoon Darrell. So tell us, what is Friends 4 Expo Transit? Friends 4 Expo Transit is a group that came together around this particular issue. Some of us date back to 1989 when the opportunity for transit along the old Expo right-of-way began with the Southern Pacific Railroad’s offer to sell a number of rail rights-of-way to the LA County Transportation Commission (LACTC), a predecessor of today’s Metro. Philip Anschutz [of AEG and the Staples Center] had purchased the Southern Pacific in 1988 in a leveraged buyout and needed cash. There was the opportunity with L.A. County’s Prop. A to sell the rights-of-way in one package. This represented an incredible opportunity for the County to have under public ownership a critical piece of any future transit plan for the region. The transaction was consummated around 1991. Also, in 1989 the city of Santa Monica had commissioned a study of light rail along Exposition and down the Lincoln [Boulevard] corridor, which doesn’t have a rail right-of-way. Santa Monica was thinking about the time the city and neighboring Venice had rail. The bus yard in Venice had been the old Ocean Park streetcar car house for a Pacific Electric line that ran down what is now Nielson Way and Pacific Avenue. It sounds like we need a little history lesson to better understand the Southern Pacific opportunity. What was going on with Expo before 1989? Going way back, in 1875 a steam railroad was built along Exposition from downtown Los Angeles to Santa Monica. The line, later referred to as the Air Line, was built by the founder of Santa Monica — Senator John P. Jones — whose home was on the site of the Miramar Hotel across from Palisades Park. Eventually, the Air Line was electrified and they ran various kinds of passenger service on it but it remained primarily a freight line. The passenger line ran until 1953; freight service continued until the mid-1980s. The end of the line for many years was Fisher Lumber, located between 14th and 16th Streets and Colorado Blvd in Santa Monica. In the final years of the line it was used occasionally to bring flatcars of lumber to the yard. Jumping ahead, there has been a tension between backers of the Southern California Rapid Transit District’s Red Line subway (today’s Metro Red and Purple Lines) and those who felt we could get more transit and more value out of light rail. When the San Diego trolley opened in 1981 it became the country’s first modern light rail line. Compared to heavy rail construction you can electrify and build light rail relatively inexpensively. As San Diego was being built a study of the possibilities for modern light rail in L.A. began under the LACTC. County Supervisor Kenneth Hahn lobbied for his district and the first project became the Blue Line, which opened in 1990. In part, for reasons of efficiency and in part, because of the competing visions of the Southern California Rapid Transit District and LACTC, then-State Assemblymember Richard Katz got legislation passed that merged the two agencies into today’s MTA. How did you get involved originally in the effort to build Expo? By 1989, the Blue Line was well under construction, Red Line construction was underway and the idea of putting light rail on Exposition became a very real possibility – LACTC and the city of Santa Monica had been exploring the possibilities. I describe my involvement as beginning with three newspaper articles in the Santa Monica Evening Outlook in 1989. The first article was about the possibility of purchasing the right-of-way and putting light rail on Exposition. The second article reported that that there had been a neighborhood meeting at St. Timothy’s Church on Pico in Rancho Park/Cheviot Hills and that the organizers had invited Neil Peterson, the chairman of the LACTC, to speak. According to the article, several people at the meeting used their comments to blast Peterson and the idea of light rail on Expo. The third article described how a citizens group in Santa Monica was forming to support the purchase of the right-of-way for transit. So I called the phone number and went to a meeting. But this story needs to say something about why I went to that meeting. I had been a student at Berkeley in the 1970s. I was interested in transit and what existed in the Bay Area, and was on the first public BART train from the East Bay to San Francisco in the summer of 1974. I wanted something like it down here and Expo presented a great opportunity. It has obviously been a long struggle to build Expo. How would you describe the early battle with those who opposed it? Some of the same players today were around then. After the right-of-way was purchased, how did things proceed? The LACTC was the agency with the money. Its board approved the purchase of the rights-of-way from Southern Pacific. The campaign in support of the purchase was completed in 1990 and the purchase was consummated about 1991. Of course those of us who supported the purchase, said OK now we want to see a light rail project there. Neil Peterson and LACTC came up with a “30-year Plan” with a number of candidate corridors and Expo was one of them. LACTC began environmental planning on several lines, including Expo, what became the Orange Line busway, the Pasadena Line and a line to Glendale. The Green Line was also under construction. The next big development was the merger of LACTC and the former RTD into the new MTA. Neil Peterson was not invited to lead the new agency and they did not have the money to do all of of the proposed projects. Even though County voters had passed Prop C in 1990, and the MTA had bond-issuing authority, plans suffered from a federal funding match that was reduced from 80 to 50 percent. The MTA released a Phase 1 draft environmental impact report for Expo in 1994 but it went into hibernation until 1998 with all of MTA’s funding going to the Red Line subway. But then – drum roll – early in 1998, for financial reasons, the MTA Board suspended the future subway extensions – to East L.A., Pico/San Vicente, and in the Valley to Van Nuys – and the Pasadena light rail project. In 1998, L.A. County voters approved Prop A, banning the use of Prop A and C sales tax revenues on any future subway beyond what was then under construction. So there was a real tension between those who supported the subway and those looking for less expensive transit alternatives? Yes. During Richard Riordan’s time as Mayor, Martha Welborne, who is now the head of countywide planning for Metro, organized a trip to Curitiba, Brazil. The trip was attended by Riordan, Yaroslavsky and others and it planted the seed of Bus Rapid Transit in the heads of several key players in the city. As I heard former Mayor Riordan say multiple times, “It’s like a subway train on rubber tires and carries 280 people.” Never mind how you squeeze 280 people into an 80-foot-long bus. During the fall of 1998, the MTA began a new planning process about what to do in place of the cancelled subway extensions – to the west and east, and through the San Fernando Valley. This had a particular urgency because the Federal Transportation Administration had authorized the Red Line’s extension through Boyle Heights and also there was some money on the table for a Wilshire/Western to Pico/San Vicente extension. How were you involved during this period? In 1998 I was invited to a meeting of community stakeholders to talk about Westside extensions other than the subway and they were looking at boulevard corridors and the Expo right-of-way for light rail or bus rapid transit. Similarly on the east side they looked at light rail and bus rapid transit options, and bus rapid transit only in the San Fernando Valley. Some of the longtime advocates like me and some newer advocates got together to work for the Expo line in 1999. We formalized ourselves as Friend 4 Expo Transit in the fall of 2000. This was concurrent with the MTA releasing a Draft EIR in mid-2000 for Expo light rail and a Wilshire BRT. The Final EIS/EIR was issued in the middle of 2001. Through a whole lot of work and organizing on our part, including the securing of individual endorsements from community leaders and a favorable editorial in the L.A. Times, we got approval of the first half of the Expo Line to Culver City in June 2001. The Friends 4 Expo Transit website News page has a detailed chronology of events. To what do you attribute the success of the campaign for light rail versus bus rapid transit on Expo? The reason that light rail was chosen for the project was because of the grassroots support for the project. The default was to do an Orange Line-like busway along Expo in spite of the fact that the Expo corridor needed the higher capacity and speed of light rail. Did the project need and gain the backing of any prominent civic leaders in particular? In 2001 the first-half light rail project gained unanimous MTA Board approval, but they still needed to complete the Final EIS/EIR. To accelerate things, around 2002 there was an important move by Zev Yaroslavsky to reprogram some Wilshire BRT dollars to fund the rest of the final environmental review for the Expo Line. What does this say about politics? That’s just how political leaders are. We bemoan the lack of leadership but look what happens when they try to lead. They get whacked for it. But think about what became the successful campaign for Measure R and later, 30/10 and America Fast Forward, and how Mayor Villaraigosa importantly marches in front. Following the MTA Board’s approval of Expo Phase One, we moved on to the Phase Two environmental review and winning approval of the project. The rest is history. You can view a high definition cab-view of the Expo Line ride here. What is it like to fight for something for 20 years and finally see it happening? [Laughing] I know. It’s crazy. Twenty-two years and counting. I didn’t expect it to become a life’s work. I guess when you believe in something that much and you see an opportunity you keep working for it. I certainly remember, it was 2000 or 2001 and the news was bad. But you pick yourself up, dust yourself off and move on. It is interesting to see. I’ve done drawings. It’s not identical to what I imagined. I think the landscaping turned out really well. The transit parkway they imagined in the planning worked out. I like the basic station design, the wave. I can take credit for coining the ‘Expo Line’ name. Originally I called it ‘Expo Rail’ and then later the Expo Line. It’s funny how some things stick. The Expo Line name solidified when Bernard Parks said he didn’t want to go with the Aqua Line color name. What is it like to tussle with the same people for so many years? Your enthusiasm for light rail on Exposition appears to have brought a lot of people into the ranks that would otherwise never have thought about supporting the project. So much of this has been about a compelling vision that people shared. It’s about working for something badly needed in a positive way; stating the facts and correcting misinformation. To generalize, when you look at the larger political world you see a lot of people saying stuff that is just false. I’ve always tried to be accurate, factual and positive. What has the project meant for you personally? Working for Expo has taken me in the direction of co-lead for the Sierra Club’s national Beyond Oil campaign. It has helped me move from being a single-issue transit advocate to taking on a broader role and project. 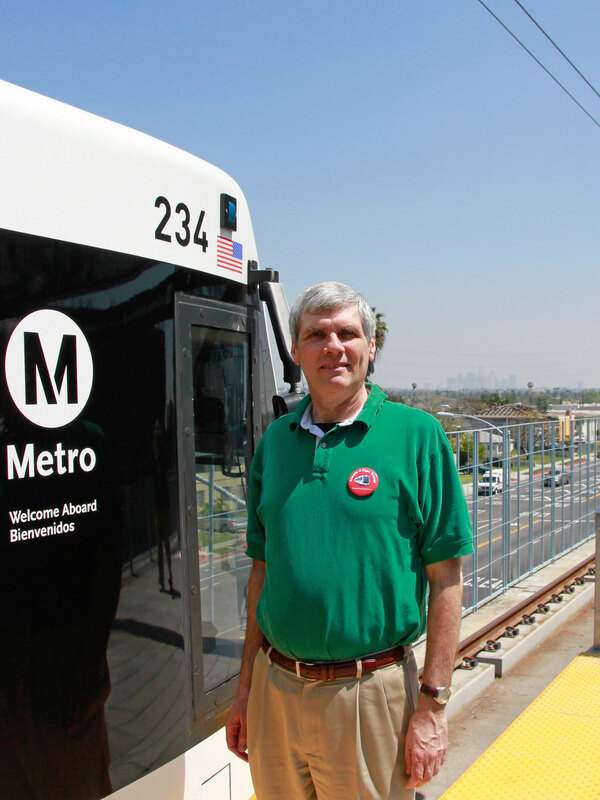 Second, I think our bringing together this grassroots support for transit has inspired others to start their own efforts – Bart Reed went off and founded The Transit Coalition, Ken Alpern started the Friends of the Green Line and Denny Zane started Move LA. It feels like we are making a difference. RELATED: Check out this photo gallery of the history of the Expo Line. Very inspiring story. Hooray for Darrell Clarke!! Thanks Darrell for all your hard and credible work==and with grace and humility. I grew to be a fan of Darrell and the Friends 4 Expo site as I learned more and more about the project. I admire his dedication and am thrilled he’s going to see this work come to fruition! I was honored to have been invited to be part of Friends4Expo in the early ‘90s. I’m sure without Darrell’s vision and sheer determination, the Expo line would still be just another abandoned railroad ROW. Great article honoring a great man! What a concept, a neighborhood, grass-roots activist who is FOR something positive for the future and the long-term. Thank you Mr. Clarke for your far-reaching vision! I am glad to see that you are getting some of the recognition that you deserve. Awesome. Just awesome. Can’t wait til Saturday. See you there! Thanks for all your hard work, Mr. Clarke. When I joined Friends for Expo, Julia Maher was the leader, and later Kathy Seal….come on, let’s give the women some credit as well!